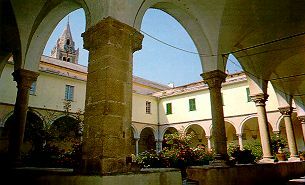 a Training Course for a group of benedictine Monks from the various Monasteries in italy. We welcomed also other religious who were already oriented towards life in a Monastery. 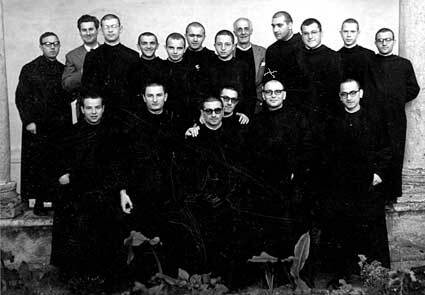 Among the participants there were also young men in their twenties interested in a serious monastic experience. These courses are held periodically in different locations. That year Finalpia hosted it. 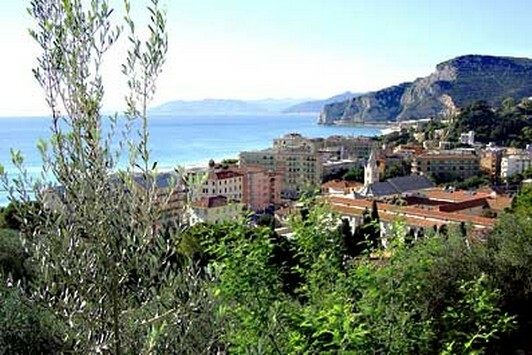 The location is undoubtedly beautiful and the climate is famously mild. it has a long tradition of hospitality. 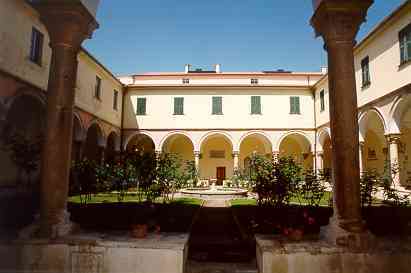 In the last century there were, for the monks of the Italian benedictine monasteries , qualified courses of philosophy and theology. who he was one of the teachers . In this group there are 2 two future Abbots . The two in plainclothes are friends. SACRED SCRIPTURE AND "LECTIO DIVINA"
Introduction to Sacred Scripture and "Lectio divina". This course must be oriented to provide the key elements for a fruitful understanding of the biblical text in order to lectio divina of the monk. Aims to treat the issues of introduction: the Sacred Scripture as the Word of God (inspiration), transmitted and interpreted in and by the Church (canon and hermeneutics); to offer an introduction to the various sections and the several books; starting with the lectio divina from specific biblical texts, according to a method dear to the Fathers. In addition, it will take care to emphasize, in continuity with the monastic tradition, as well as understanding and assimilation of the revealed Word, will always take place in the same Spirit in which it was written, and requires therefore to be accompanied by prayer, so that it may establish a true dialogue between God and man. The psalms are, the frame of the Opus Dei, demand a serious and in depth initiation. We will illustrate, therefore, the place that the psalter had in the Old and the New Testament , the particular fondness the Fathers had for it and the monastic tradition, to come to present the individual psalms according to their literal meaning, the christological, ecclesial, and their reference to the personal experience of a christian and a monk. In this way, the young candidates will be educated to an understanding of true christian prayer, which is both a prayer of the individual believer, of Christ and of the Church, the word of God which resounds on the lips of the human and therefore an appropriate response to God by man. Course of introduction to the O. T.
1. The "holy” (scripture) the word of God in human language: the nature of inspiration. 4. The revelation in history: a glance to the historical reflection ("historical books" ). 5. The revelation in history: the experience of liberation and of the alliance (the God of the exodus). 6. The revelation in history: the ancestral traditions and the reflections on the origins (the Patriarchs and the “beginning”). 7. The prophetic word: a glance to the history and the prophetic literature. 8. The word prophetic: the prophetic vocation (Is 6,1-13). 9. The prophetic word: critical consciousness within the alliance (the oracles “against”). 10. The prophetic word: the message of consolation (vision of the future with God). 11. The sapiential reflection: a glance at the wisdom literature of the ancient Middle East and of the Bible. 13. The sapiential reflection: human values in their deep meaning (Song of Songs). 15. Examples of reading of the various “words” of God. Course of introduction to the N. T.
The course of Introduction to the N. T. wants to teach how to read the Gospels looking back on the time that goes from written texts, through oral tradition up to the preaching of Jesus himself. To this aim, we will study first the environment of life and the culture in which Jesus lived (the jewish world), the economic and politic situation (the roman Empire), historical events (from Herod the great to the 70d.C., the date of the destruction of Jerusalem by Titus). Then you will compare the preaching and the figure of Jesus of Nazareth as a Rabbi who stands out from the other doctors of the law, the scribes and the pharisees). Finally, from the comparison of the synoptics it will outline the development of the thought of Jesus (Gospel of Jesus) the preaching about Jesus: Messiah, Son of God, Lord and God. The acts of the Apostles and the pauline thought will be treated succinctly. 1.The history of the text of the N. T.: the origins, language, dissemination, transmission, critical text, translation. 2.The historical method, critical description, its application, its evaluation in exegesis today. 3.Kinds of literature: exegesis, hermeneutics and theology. 4.The history of Palestine and of the institutions of the jewish and of religious groups at the time of Jesus and the origins of Christianity. 5.Chronology of the individual writings of the N. T. in relation to the history of Christianity and of the universal history. 6.The hellenistic culture and the roman Empire. 7.The synoptic Gospels: the thought of Jesus (loghia) and the theological contribution of Mt Mk Lk. 8.The writings of John (introduction). 10.Exegesis of selected tracks in order, theology, and Lectio divina. The history and spirituality of the monastic. This course “will not be content to present a review of the facts, in the context of the institutional aspect, but they will mainly explain the experiences and the spiritual teachings that there are underlying” (Plan of Studies 71, no. 22), starting from the very beginning up to our days. The course will take on a vital character if in the presentation of this multiplicity of forms in which is embodied the monastic ideal, the youth will be able to understand of the useful stimuli for the growth of monasticism. “In this way, the story rediscovers the values with which to compare and enrich the present. In this juxtaposition between the past and the present we will avoid the stumbling block of archeologismo, bearing in mind that the tradition is not to conserve the past, but in update it, making it come alive in the present” (Plan of Studies 71, no. 22). It will be to maintain that ideal balance between fidelity and innovation which is the eminent example of the Rule of St. Benedict. In this historical framework we will be able to insert appropriate references to art and iconography that in the course of the centuries, are expressed in the context of monasticism. A reasonable space will be given to the study of the history of our Congregation of Subiaco, the monastery of belonging and to particular monastic phenomena eventually revealed in the region in which you live. I.The general Introduction. The historical knowledge. The history of the Church and the history of monasticism. Methodology. The morphology of the religious life (six types). III. General overview: the monastic life and territory. IV. The origins. Monks and society in late antiquity. V. General characteristics of the ancient monastic literature. VII. Saint Benedict: the life, Rule, sources. VIII. St. Benedict: the discipline, institutions, and spirituality. IX. St. Benedict: the spread of the Rule, the image of the saint. X. Monasticism in the High middle Ages. St. Gregory The Great. The expansion in the european continent. XI. From S. Benedict of Aniano to Cluny. XII. Monasticism in the middle Ages. The crisis and reforms. XIV. Environment and daily life.